If you're looking for minivan utility and storage space, without the minivan look, the Journey is a viable option. With its available third-row seating, it offers more room than the Ford Escape and Chevy Equinox. I bought the 2010 Journey sxt in dec 2009. Within 6 months the brakes had to be replaced. This model car has braske wear issue. It wears out to fast dodge knows it does so they extended the warranty. To 24000 kms. Next ignition module issue had it replaced 3 times twice by recall. Car would stall any time at random. Next ghost issue ( started with 2009 model apparently) where you go to start the car sounds like starter is gone. This cost me $600.00 to replace starter i did not need. Only to find out on you tube that if i shifted the car from park to neutral the car would have started. Dodge has yet to address this issue. The hood spray nozzels had to be replaced 3 times. Just be normal wear. My visor screw fell out . With in 3 years the engine developed a knocking sound. A warning that the 5th cylinder is not firing . I have yet to find a dealer who can address that issue. The journey is now 8 years old it lost power sense its younger years has hard time shifting gears when i accelerate Stalls like all the time especially when it rains. What I like about this piece of crap ? Seats are comfortable It still runs even though it has 300,000 + km on it. Would I buy a dodge again? Not a chance. But i will run this one into the ground. The 2010 Dodge Journey has coolers in the floor board and in the dash! 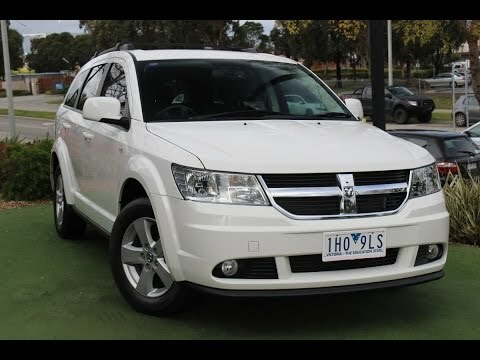 I have a 2010 Dodge Journey and I love it! My SUV has the third row which is great for kids and pets I love that mine has the handles on each side one is to put the seats all the way down to move the seats back and forth so that tall people can sit in the back and that the seats easily slide forward to get to the third row. I love that there is coolers in the floorboards and you can keep drinks cold love that for long trips. I really like the space in this SUV easy to drive and handle. I don't think there isn't anything I don't like about it I am for sure going to get a newer Dodge Journey I'd like to have an AWD SUV. So overall it's a great SUV. The backup camera feature so I can see the lower part of the car to help me see. It is very good on gas and when you get low on gas it gives you a gas light to indicate you need to get more and it lets you make it to the gas station before you run out. My experience on the performances just fine I have not had any real issues except for regular maintenance. It works for my family I can adjust the seats up and down for big friends coming over or just a little ones playing in the back. The major feature I like it has the auxiliary cord so I can use my iPod to play music from my phone. And I like the back-up camera on this car it help me to see lower part of the car so I can see behind me so I do not run into anything. CHRYSLER IS RECALLING CERTAIN MODEL YEAR 2010 DODGE JOURNEY, GRAND CARAVAN, AND CHRYSLER TOWN & COUNTRY VEHICLES MANUFACTURER FROM AUGUST 3, 2009, THROUGH JUNE 17, 2010. SOME VEHICLES MAY EXPERIENCE INADVERTENT IGNITION KEY DISPLACEMENT FROM THE RUN TO ACCESSORY POSITION WHILE DRIVING CAUSING THE ENGINE TO SHUT OFF. ENGINE SHUT OFF WHILE DRIVING COULD INCREASE THE RISK OF A CRASH. DEALERS WILL REPLACE THE WIN MODULES FREE OF CHARGE. THE SAFETY RECALL IS EXPECTED TO BEGIN DURING APRIL 2011. OWNERS MAY CONTACT CHRYSLER AT 1-800-853-1403. This defect can affect the safe operation of the airbag system. Until this recall is performed, customers should remove all items from their key rings, leaving only the ignition key. The key fob (if applicable), should also be removed from the key ring. Chrysler Group LLC (Chrysler) is recalling certain model year 2009-2010 Dodge Journey vehicles manufactured June 29, 2007, to June 17, 2010, and 2008-2010 Dodge Grand Caravan and Chrysler Town and Country vehicles manufactured January 26, 2007, to June 17, 2010. Road conditions or some other jarring event may cause the ignition switch to move out of the run position, turning off the engine. If the ignition key inadvertently moves into the OFF or ACCESSORY position, the engine will turn off, which will then depower various key safety systems including but not limited to air bags, power steering, and power braking. Loss of functionality of these systems may increase the risk of crash and/or increase the risk of injury in the event of a crash. Chrysler will notify owners, and dealers will modify the ignition switch, free of charge. The manufacturer has not yet provided a notification schedule. Owners may contact Chrysler customer service at 1-800-853-1403. Chrysler's number for this recall is L25. Note: This is an expansion of recall 11V-139. Chrysler (FCA US LLC) is recalling certain model year 2009-2016 Dodge Journey vehicles manufactured July 31, 2007, to November 12, 2016. After exposure to cold temperatures, the power steering return hose may rupture at engine start-up causing a loss of power steering assist. A loss of power steering assist may require extra steering effort, especially at lower speeds, increasing the risk of a crash. Chrysler will notify owners, and dealers will replace the power steering return hoses, steel tubes, and power steering oil cooler, free of charge. The recall began on May 24, 2016. Owners may contact Chrysler customer service at 1-800-853-1403. Chrysler's number for this recall is S08. CHRYSLER IS RECALLING CERTAIN MODEL YEAR 2010 CHRYSLER SEBRING, 300, CHARGER (LX) AND DODGE CHALLENGER (LC), AVENGER (JS), AND JOURNEY (JC), AS WELL AS MODEL YEAR 2011 DODGE RAM LIGHT DUTY PICKUP (DS) VEHICLES. SOME OF THESE VEHICLES MAY EXPERIENCE A SEPARATION AT THE CRIMPED END OF THE POWER STEERING PRESSURE HOSE ASSEMBLY. LEAKED POWER STEERING FLUID ONTO HOT ENGINE COMPONENTS COULD CAUSE A FIRE. DEALERS WILL INSPECT AND REPLACE AS NECESSARY THE POWER STEERING PRESSURE HOSES FREE OF CHARGE. THE SAFETY RECALL IS EXPECTED TO BEGIN DURING OCTOBER 2010. OWNERS MAY CONTACT CHRYSLER AT 1-800-853-1403.